Mezrano Law Firm P.C. has been named title sponsor of the Alabama FC WPSL Franchise for the 2019 summer season. 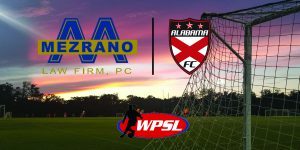 Mezrano Law Firm logo and imagery will be front and center on all jerseys, training tops and all other Alabama FC WPSL gear and clothing for the 2019 summer season. The Women’s Premier Soccer League is an independent national league whose primary focus is on the development of highly competitive premier women’s soccer teams. The WPSL’s focus is to promote the quality and stature of female athletes as role models to our youth. The WPSL formed in 1998 and is governed by USSA, as an affiliate of USSF and FIFA. The Mezrano Law Firm is Alabama’s Personal Injury Law Firm, quickly becoming one of Alabama’s best Car Accident Injury Law firms. Located across the state of Alabama they are available to assist anyone who needs legal counsel to recover from their Car Accident Injury. In the combined 40 years, we have been practicing law, our personal injury attorneys have earned a reputation for being caring, and supportive of their clients, yet tough and aggressive when it counts. They will go above and beyond to represent their clients.